We are pleased to announce the release of HelpSmith 7.2 that adds support for batch compilation mode, a detailed compilation log that analyzes your help project and helps you avoid typical issues in the generated documentation, includes improved support for video files for compatibility with modern HTML5 browsers, and other enhancements. 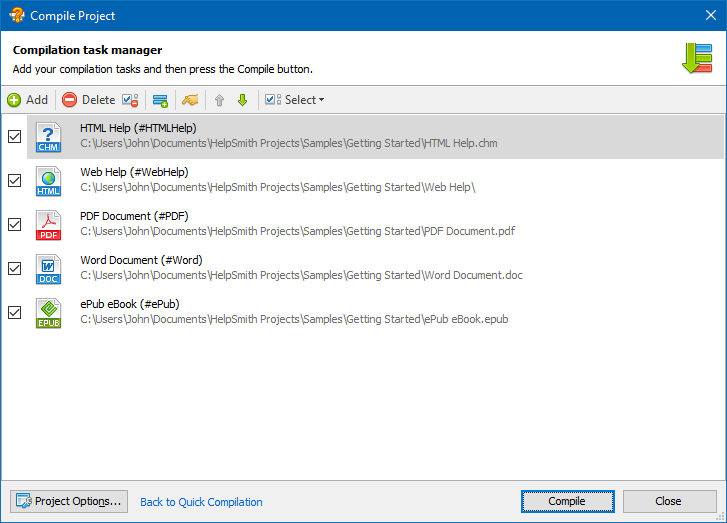 HelpSmith 7.2 provides you with the possibility to create compilation tasks and, as a result, compile your help project into multiple output formats, or to create different version of the same help file with a single click. It should be pointed out that for any compilation task, you can specify the help file’s destination path and select build tags. 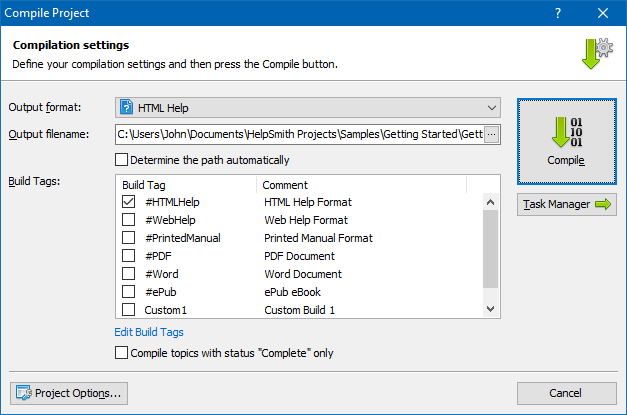 In addition, a compilation task allows you to override the default topic template, and values of text variables that are defined on the project level. 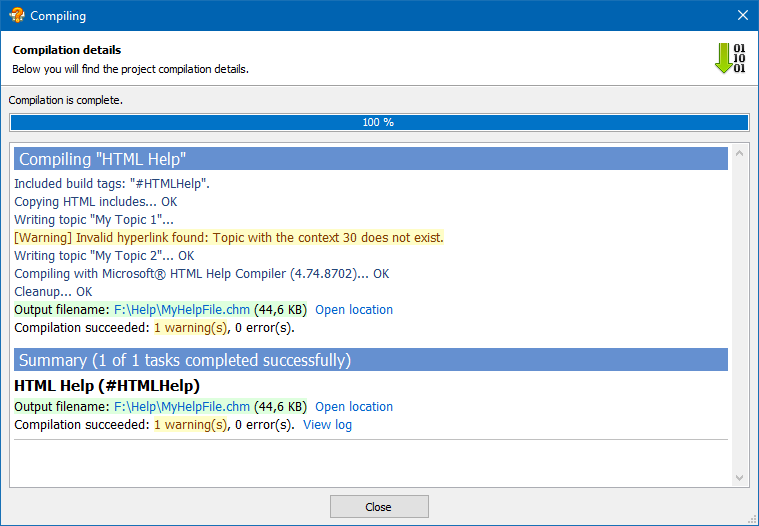 The new HelpSmith version now analyzes your help project and displays a detailed compilation log allowing you to avoid typical issues in the compiled help file or document, such as broken hyperlinks, missing images, possible issues with a template, etc. It should be pointed out that the compilation log in HelpSmith takes into account the build tags selected for a specific compilation, and thus you will get actual details for a specific version of your help file or document. In HelpSmith 7.2 we have simplified the way to change the destination filename or folder of the compiled help file or document. Now for both regular and batch compilation modes, you can easily specify the output directory directly in the Compile Project dialog instead of editing the Project Options as it was implemented previously. In this update, we have revised the usage of video files in different output formats, which provides better compatibility of the generated documentation with modern HTML5 browsers. For example, while HTML Help (CHM) allows you to use any video formats including AVI, WMV, SWF, MOV, MP4, and M4V, for other HTML-based formats such as Web Help and ePub, it is recommended to use only MP4 and M4V files since the other video formats may not be supported by modern browsers. Added support for the M4V video format. Video from YouTube did not work in HTML Help (CHM) files. Command line compilation: the console window now displays the compilation details including warnings and errors, similarly to the regular compilation mode. The command line now allows you to override values of both system and user text variables. A new sample help project added to demonstrate the possibilities of the built-in Image Tool for writing documentation for the user interface of an application.